WD's wait-and-see approach to solid-state storage has been fascinating to observe. Having surveyed the changing landscape of computer storage requirements, the firm decided in 2015 to make its move by acquiring SanDisk for a cool $19 billion. Fast forward to today and the storage giant has built a healthy portfolio of SSDs that make good use of SanDisk's expertise in non-volatile memory. The recently-released Black SN750 NVMe drive now serves as a go-to solution for PC enthusiasts seeking maximum performance, but the drive that follows, the Blue SN500 NVMe, is every bit as interesting, if not more so. 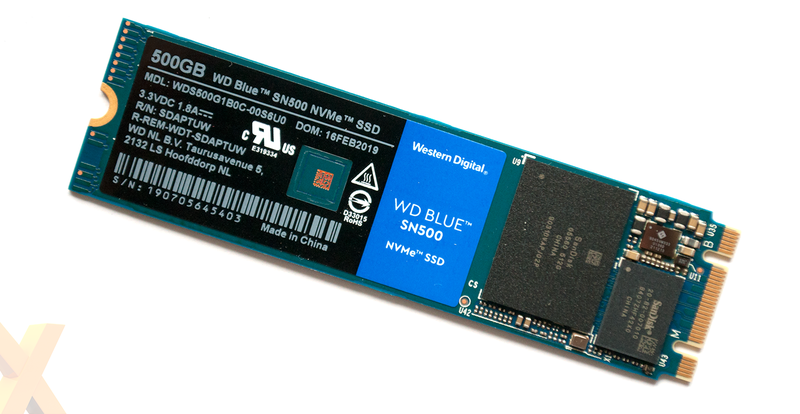 Introduced as a means of bringing NVMe technology to mainstream audiences, the latest WD Blue SSD touts sequential speeds well in excess of existing SATA solutions, while keeping the starting price below £50. Sounds like a winning formula, so how did the Blue SN500 come about? Much like its Black sibling, WD's latest M.2 offering effectively takes an existing OEM drive and repackages it for the consumer market. Whereas the Black SN750 is, for all intents and purposes, a rebranded SN720, the Blue SN500 is last year's SN520 going by another name. But that's no bad thing, as the drive's composition has plenty to offer for consumers hoping to upgrade from a SATA drive, or even those who are yet to dip their toe in SSD waters. Perusing the specification table confirms that, as expected, WD is continuing to employ an in-house controller paired with SanDisk's 64-layer 3D TLC NAND. The core ingredients are a known quantity, but in order to meet the lower price, the controller interface is cleaved from four PCIe Gen 3 lanes to two, effectively halving sequential read speed from around 3,400MB/s to 1,700MB/s. A significant cut, but WD's lower-cost NVMe solution is still some 3x faster than a SATA drive. The second intriguing point of differentiation is that the Blue SN500 does without the 1GB DRAM cache of its high-end sibling. WD is being coy on how it minimises the performance deficit of a DRAM-less configuration, with the official documentation stating only that the drive uses an "in-house tiered-caching NVMe architecture." When quizzed as to whether or not this indicated utilisation of the Host Memory Buffer (HMB), introduced in the NVMe 1.2 specification as a means for DRAM-less SSDs to use system memory to cache mapping information, the reply from WD was simply to state "yes, it does use HMB." Make of that what you will, but we wouldn't be surprised if the SN500 controller contained a small amount of onboard memory to help things along. It stands to reason that the Blue SN500 isn't intended for the most demanding of scenarios, yet the inclusion of the 'tiered-caching' architecture is such that performance remains strong across the board. Random 4K performance of up to 300K IOPs isn't quite as impressive as the Black SN750, yet it remains a significant improvement over DRAM-less SATA drives such as WD's entry-level Green SSD. Another upside to the streamlined design is increased efficiency, with the Blue SN500's idle power consumption dropping as much as 65 per cent over the Black SN750. Although the OEM-specific SN520 is available in a choice of form factors, it is no surprise to find that the consumer-focussed Blue SN500 is only presented in the common M.2 2280 format. The drive's simplistic appearance is reflective of its position in the market, yet it is good to see that WD has managed to retain the 1.75m hours life expectancy of its high-end offering, while offering the same five-year warranty as standard. The WD Blue SN500 NVMe has the makings of a shrewd system drive, with capacity being the one potential drawback. At launch, only 250GB and 500GB capacities are being made available, priced at £47 and £67, respectively. 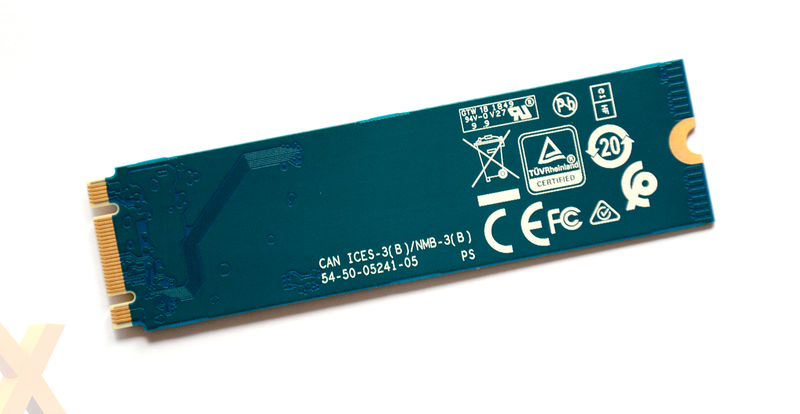 WD obviously sees merit in partnering a fast NVMe SSD with a spacious hard disk, but we're hoping to see a 1TB model added to the line-up in the near future. We've had the 500GB drive installed in our test bench this past week, so let's now peruse the numbers.